:Right now, someone you know is in desperate need of your prayers. It's the person out on the front line, leading God's army into the world to proclaim His good news. Pastors, teachers, and all types of leaders are under severe attack from the enemy. And they're depending on the prayers of those who care to help see them through. You can help these leaders by reinforcing them through intercessory prayer. 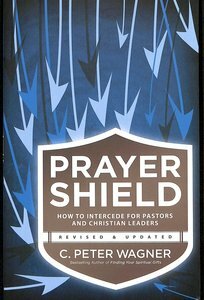 About "Prayer Shield - How to Intercede For Pastors and Christian Leaders (Prayer Warrior Series)"
Dr. C. Peter Wagner is the President of the Global Harvest Ministries and Chancellor of the Wagner Leadership Institute (established in 1998). Prior to this, Wagner and his wife served as missionaries in Bolivia, and from 1971, he was Professor of Church Growth at Fuller Theological Seminary School of World Missions and served on several mission oriented committees and organizations such as Lausanne Committee for World Evangelization and American Society of Missiology. Wagner has also been associated with several global movements of the Holy Spirit. His outspoken advocacy of praying for the sick, spiritual mapping, identificational repentance, the ministry and role of apostles and prophets in the church today, and demonic deliverance have identified Peter as a pioneer in the arena of spiritual warfare. Perhaps his most significant contribution so far has been his relentless effort to promote strategic and effective prayer. Wagner has written over 60 books. Those currently in print include: Your Spiritual Gifts Can Help Your Church Grow, Strategies for Church Growth, How to Have a Healing Ministry, Prayer Warrior Series, and Churchquake!